Led Zeppelin's Jimmy Page and John Bonham making some noise in the mid-'70s. Forget subtlety: for this stop on the SampleRadar journey, we're going for bold and brash drum and guitar sounds. We'll think you'll hear echoes of Led Zeppelin in some of the beats, and in honour of Solo Week, we've even included some lead guitar snippets alongside the heavy riffs and chugs. The samples are split into seven folders, each of which is named to give an indication of the type of drum or guitar sounds contained within. All the samples are supplied as WAV files so can be imported directly into your DAW or sampler of choice. Because they're royalty-free, you're welcome to use the samples in your music in any way you like - all we ask is that you don't re-distribute them. 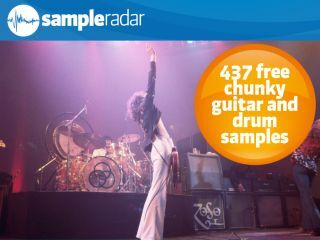 The chunky drum and guitar samples are supplied in a zip file, so you'll need to extract them before you can see them. Enjoy! These samples originally appeared on Future Music magazine's cover DVD. Check out the latest issue for many more.